National Star’s partnerships with health services, education providers, and employers enable us to provide students with a wealth of opportunities that support them to reach their potential. We also work with other specialists to pursue ground-breaking ideas that make a real difference not just to those living locally, but people with disabilities living abroad. In July 2014, seven National Star College learners completed a pilot internship programme at the Barnwood offices of EDF Energy. The students began their internships in January, and joined 1,600 employees to assist with electricity generation, training, customer service and business support. Since 2011, National Star has partnered with the Independent Specialist Colleges Beaumont and Henshaws to share expertise in enabling and assistive technologies with other educational providers. 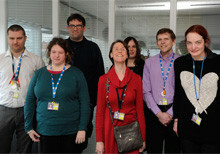 Funded by Jisc, the Dart Project provides support for organisations to introduce a specialist Assistive Technologist role and training for staff teams.